Another domino fell in the fight for open markets and individual freedom as Worcester County, Maryland opened its doors to the free market by closing the county-controlled liquor board that mandated all businesses had to buy from them. (You never hear of places going to the PA way do you?) While the county is still going to try and remain a wholesaler in competition with private businesses, those businesses are free to shop wherever they want. This could be a good way to gauge if the PLCB would be competitive if faced with free market competition, although the PLCB, with a bloated management and office staff, isn't as efficient compared to the county. So raise a glass of whatever beverage you enjoy, and wish the people of Worcester County the best as they join most of Maryland and 33 other states in using their freedom of choice. Maryland is right next door, so maybe this will rub off on the group of dunces we have in the Senate as they see how the majority of the country works just fine without any socialist intervention by unqualified cube rats in Harrisburg. Keeping up their streak, the PLCB is still giving discounts to those who drink the higher end items and shafting those who don't. From the July meeting agenda. See if you can find your own. Today we are going to look at some disparities in the PLCB mark-up. Part of the so called "modernization" is to have variable pricing, where the PLCB would raise the price (change the mark-up) of Captain Morgan a quarter so they could lower the price of Johnnie Walker Blue, for example. But first a little history. Remember the PLCB was tasked to come up with a variable pricing plan in 1985 (within the Liquor Code). They did, but it was never implemented according to the Legislative Finance and Budget Committee Performance Audit of May1992. However, it seems that there is already a variable mark-up in use. Looking at the June PLCB meeting minutes on page 27 you'll see Chateau D'yquem Sauternes for a unit cost of $681.05 and a retail cost of $909.99. Now to get from unit cost to retail you have to add on the 30% PLCB mark-up and the 18% JFT. There are some minor things like roundup and bottle fees that might add a few dollars too. So we have: $681.05 X 1.30 = $885.36 which is the markup. But $1044.73 is not $909.99! So who gets shorted? The State or the PLCB? If the PLCB gets shorted, then the markup is only 13%. If the state is being shorted, then they are only getting 2.5% of their Johnstown Flood Tax, and not 18%. I'd like to hear that explanation. Is the PLCB just arbitrarily changing mark-up so their prices are somewhat within range of normal and not so high as to be laughable? If they are, then why does that have to be "modernized," since they are already doing it? I find it interesting and this is not the only one - just the most glaring. Another from the same meeting on page 29: Chateau de Beaucastel has a unit cost of $383.71 and a retail price of $519.99; again the math doesn't match. There are more, and you can do the math yourselves. I can find examples in other board meeting minutes, in fact, every one I've looked at (although I haven't looked at all of them nor every item). So what is going on here? A Union representative said it was probably a reporting error, which, if true, would explain it all away, but then bring up the question of why are there so many and why is it only on high priced items? Why don't regular items have as many reporting errors? I've gone through a pretty good number of them and you are welcome to try too...but so far it is only higher end items. 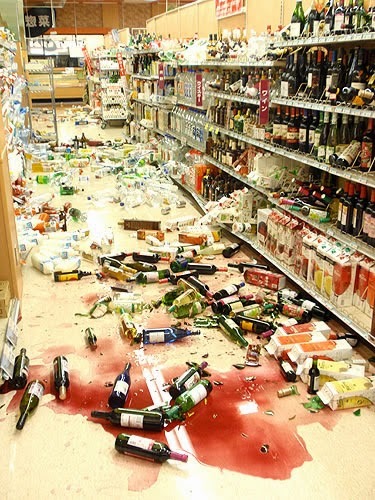 Even more proof is the infamous Screaming Eagle Wine debacle when the PLCB not only didn't pay the Flood Tax, make any mark-up at all and lost over $7,000 on the original unit cost of 10 bottles. I didn't see any legislative action approving that. That seems pretty variable to me going from 30% to -25% and not collecting or paying any taxes. Does this mean the PLCB is somehow giving a break to people who can afford $900 bottles of wine while shafting the average citizen? Sure looks that way but if any representative of the PLCB wants to offer an explanation, I'll post it. I know that the Office of the Chief Council of the PLCB reads this since she has searched me out, so c'mon Faith you or your minions pass this along to somebody who can answer it. PLCB competitive? Only when the wrong numbers are used. I've been waiting to post this just in case the author or editors of the PG decided to post a retraction, correction, or even apology for publishing such a mistake-filled and incorrect article. Alas, no response to my emails to them and nothing in the paper itself. It looks like good journalism has fallen by the wayside at the PG, or at least when it comes to this piece. 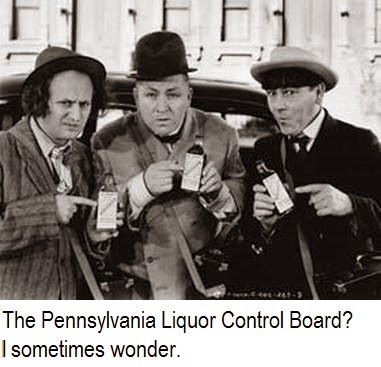 The other day the Pittsburgh Post-Gazette ran a story about how PA prices were competitive with those of Ohio and West Virginia, both alcohol control states as is PA. The story itself was filled with all sorts of errors that you can read about in the comments, but our trusty Union Representative said that it "Doesn't change a thing about the premise of the article which is absolutely true." 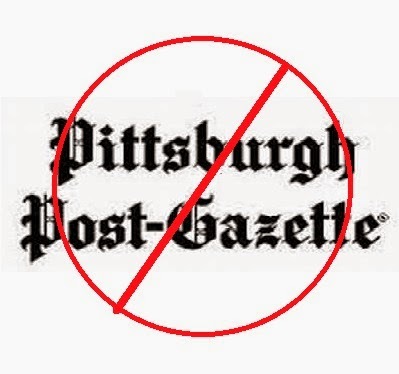 Oddly the PG says "The policy of post-gazette.com is to correct content mistakes in articles, blog posts and on social platforms as quickly as possible. Corrections to articles will be posted at the bottom of the articles. The text of those corrections will be displayed here." Not like they have to stop the presses to print the correction on-line. Isn't 4 days enough time to check a website? Myself and others were able to check the prices in minutes not days. Based on their website list of corrections the PG has made any in a day shy of 2 months so maybe they aren't "as quick as possible"
The story got me to thinking about why it might be true. Ohio ranks as #11 in liquor taxes and PA is #15 with 36.2% lower taxes than Ohio according to the Tax Foundation so it really should be a surprise that prices are close. Add to the disparity that Ohio generally has a higher sales tax (local and state) than PA and the difference should be even larger. What does Ohio do better than PA? More efficient, smaller bureaucracy, less graft, less bloated management, and maybe less child killing greed than the PLCB? They also have more convenience with wine and beer both sold by private businesses. The real question shouldn't be if PA liquor prices are competitive with Ohio but why doesn't PA beat Ohio across the board? The PLCB, not known for their problem solving ability, continues to create problems caused by their own inefficient business model and inability to adapt. The bloated overhead, incompetence, top heavy management, and lockstep mentality prevents them either coming up with solutions that a real business would, or varying from their "one size fits all" systemic thinking. An example of this is being played out in a corner of Westmoreland county. The PLCB has two stores in Belle Vernon, PA. One is actually in the town, while the other is in what is called the tri-county area. where most of the retail stores are. The store at 321 Tri-county Lane, which they want to replace, is about 120 feet from the entrance to the Giant Eagle grocery store, which follows the current publicly expressed desire to have stores in or near a grocery store. They want to move it someplace within a mile of the current location -- how convenient. They are also going to make the new store bigger, going from about 3,000 square feet of retail and warehouse space to 4,500 square feet and they say that this will happen by the fall of 2015. Or it might be like Lebanon, which inexplicably took 3 years to move and upgrade (and it still isn't done yet), or like the store in Mountaintop which took over 2 years to move less than 100 feet, or the one in Philly near Penn that took over a year. You get the picture. We'll see at some point if they hold true on this one. If you want to see what it will supposedly look like, the PLCB used the exact same plans for store 4027 at Pittston Crossings in Pittston Township. Seriously, they didn't even change the store number on the plans to reflect the different store. So there is the conundrum. Do you keep the stated goal of customer convenience, or do you put some lipstick on the pig of a state store and make it larger but carry less different products per square foot, as all the remodeled stores do? Also, with this larger store, will the smaller store in Belle Vernon stay open, or close? I can't find an answer to that, but the PLCB has closed 20% of their stores in the union era. It apparently just got too expensive to keep them open. What would real businesses do? To start with, one owner probably wouldn't have the only two locations in town! It turns out the parcel of land directly behind the current store is empty and not owned by the shopping center. That would be the first thing I would look into, if the zoning would allow a store to be built and what kind of deal could be made with the current owner. However, the PLCB doesn't want to own their stores and makes no permanent investment in the locations they are in (I don't think redecorating counts), so unless the owner wanted to do everything up front and then lease it -- the PLCB isn't interested. The next thing would be to look at the market. Would a real specialty store be profitable? I don't mean a PLCB "specialty" store (which is just a regular PLCB store with Chairman's Selections), but a store that caters to the harder-to-find items in wine and liquor. The PLCB could do that if they weren't so locked into the cookie cutter approach (and if they knew how to sell product), but the biggest reason they don't do it is that they can't afford it. The less expensive the item, the more profit margin they make. As I showed in this story, they can make over 80% and sometimes near 100% margin (including the JFT) on an $9-11 bottle of wine but only about 50% on a $100 bottle of wine. When you don't know how to sell good wine, and the majority of wine you do sell is lower priced, that can be a problem. Lastly, remember how the Union says that they provide rents to local property owners as a so-called benefit of the state store system? In this case, the Glimcher Group whom they rent the current store from is a multi-state corporation with properties in 13 states.